Harley Edward Streten — known professionally as Flume — is an Australian record producer, musician and DJ who broke out in early 2014 to the accolades of the bedroom producer community. Arguably one of the first to define the future bass genre, his sprawling and caffeinated saw synth drops would go on to fuel the creative process of an entire legion of SoundCloud producers. That said, an iconic producer does not necessarily make for a great performer, and this was the unfortunate reality of Streten's headlining performance at WayHome. 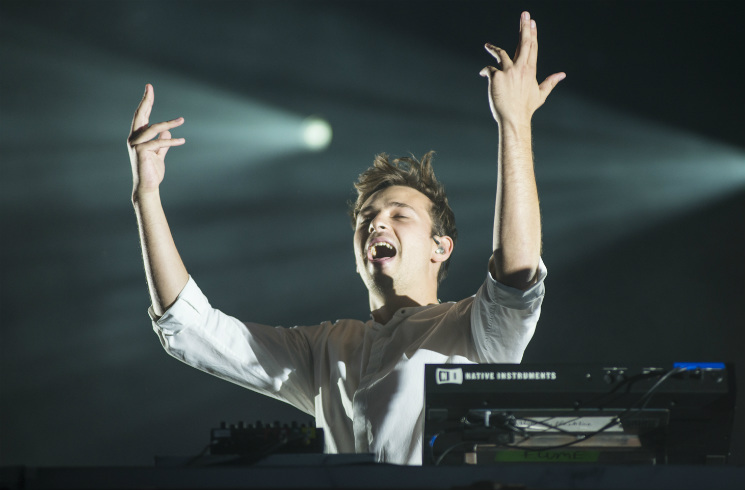 Vintage cuts from his body of work like "On Top" received the most enthusiastic response from the crowd, and the majority of Flume's set was carried by his debut album's singles stacked on top of one another, which didn't make for particularly clean transitions; they were jarring and nearly interrupted each other as Streten moved from one anthem to the next. Mechanical particularities aside, the performance had its redeeming moments—namely the drop of the producer's "Tennis Court" remix, as it was drawn out into an extended live remix using a sample-launching rig. The visual accompaniment to his set also featured Southern gothic-inspired iconography, aestheticizing the performance to a height met by no other stage that evening. It's unfortunate that with not enough regard for the pulse of the audience, it felt more like a highlight reel of the producer's many career milestones, as opposed to a properly executed set. Still, diehard fans were visibly in awe.